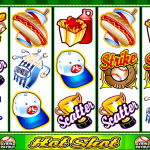 Hot Shot is a baseball themed video slot game from Microgaming. You do not have to be an American to love this sport but we are sure that no matter where you are from, you will love this slot. The graphics are sleek and clear and your experience while playing this game will be unique. There are not many details in this game, and the symbol take up the most space on the reels. All the symbols are theme related so you can see a baseball cap, a glove, hot dog, and coffee, just to name some. This is a very colorful and vibrant game that is easy to play. 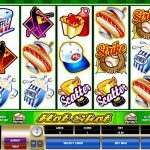 If you are a fan of special features like free spins and mini bonus games than you might be slightly disappointed to find out that Hot Shot does not have any of those. But things are not so grey after all; the slot still has something to offer to make the game play experience better for you. There is a scatter symbol which is the trophy and even though it is not used to activate any special feature it still offers some scatter payouts. All you need to do is to land 3, 4 or 5 scatter symbols anywhere on the reels. Then we have the Wild Ball which is the wild in this game and its function is to substitute for every other symbol except for the scatter to complete a winning line. 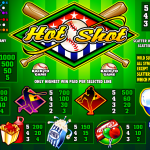 Hot Shot is an older slot from Microgaming but it is still played today. This tells us a lot about a given game. There are no special features but this is because they wanted to create a game we can escape to every time we are fed up with all those complex games. Ig you love games with huge jackpots and nice storylines consider playing Immortal Romance a 5 reel slot by MicroGaming.